Glucose tolerance (GT) has not been taken into consideration in investigations concerning relationships between coagulopathy and multiple organ dysfunction syndrome (MODS), and endothelial cell activation/endothelial cell injury (ECA/ECI) in septic patients, although coagulopathy is known to be influenced by blood glucose level. We investigated those relationships under strict blood glucose control and evaluation of GT with the glucose clamp method by means of the artificial pancreas in nine septic patients with glucose intolerance. The relationships between GT and blood stress related hormone levels (SRH) were also investigated. The amount of metabolized glucose (M value), as the parameter of GT, was measured by the euglycemic hyperinsulinemic glucose clamp method, in which the blood glucose level was clamped at 80 mg/dl under a continuous insulin infusion rate of 1.12 mU/kg per min, using the artificial pancreas, STG-22. Multiple organ failure (MOF) score was calculated using the MOF criteria of Japanese Association for Critical Care Medicine. Regarding coagulopathy, the following parameters were used: disseminated intravascular coagulation (DIC) score (calculated from the DIC criteria of the Ministry of Health and Welfare of Japan) and the parameters used for calculating DIC score, protein-C, protein-S, plasminogen, antithrombin III (AT-III), plasminogen activator inhibitor-1 (PAI-1), and tissue plasminogen activator-PAI-1 (tPA-PAI-1) complex. Thrombomodulin (TM) was measured as the indicator of ECI. There were no significant correlations between M value and SRH, parameters indicating coagulopathy and the MOF score. The MOF score and blood TM levels were positively correlated with DIC score, thrombin-AT-III complex and tPA-PAI-1 complex, and negatively correlated with blood platelet count. GT was not significantly related to SRH, coagulopathy and MODS under strict blood glucose control. Hypercoagulability was closely related to MODS and ECI. Among the parameters indicating coagulopathy, tPA-PAI-1 complex, which is considered to originate from ECA, seemed to be a sensitive parameter of MODS and ECI, and might be a predictive marker of MODS. The treatment for reducing hypercoagulability and ECA/ECI were thought to be justified as one of the therapies for acutely ill septic patients. Hypercoagulability and decreased fibrinolysis, including increased PAI-1 level, are often found in the clinical field and are considered to be the risk factors of cardiovascular diseases and glucose intolerance, especially in patients with noninsulin-dependent diabetes mellitus (NIDDM) [1,2,3,4,5,6]. Most of the acutely ill severe patients also have coagulopathy, and they often have glucose intolerance. The relationships between coagulopathy and organ dysfunction/glucose intolerance in the acute ill phase have not, however, been clearly analyzed. Although there are reports investigating the relationship between coagulopathy and organ dysfunction [7,8,9,10,11,12,13], and the relationship between coagulopathy and endothelial cell activation/injury [14,15,16,17] in septic patients, there is no report investigating the relationship between coagulopathy and GT in septic patients as far as we know. Moreover, parameters related to coagulopathy are known to be influenced directly by the metabolic factors. For example, glucose, insulin, and fat influence the production of PAI-1, which is the important parameter related to coagulopathy [18,19,20,21,22,23]. In aforementioned reports, however, metabolic factors, especially blood glucose level (BG) that is usually unstable in the septic state, are not taken into consideration. We have been using the bedside type artificial pancreas (AP) in septic patients with glucose intolerance since 1985 to control BG, to perform effective nutritional support, and to evaluate metabolic disorders including glucose and fat. By strictly stabilizing BG using AP, analyses of the factors including PAI-1 that are influenced by BG are considered to be correctly performed. The purpose of this study is, first, to analyze the relationships between coagulopathy, including abnormal blood PAI-1-related parameters, and glucose tolerance, MODS, and endothelial cell injury. Second was to investigate which parameters related to coagulopathy were most closely related to glucose tolerance, MODS, and endothelial cell injury, in septic patients with glucose intolerance in whom BG was strictly controlled and the glucose tolerance was evaluated with the glucose clamp method by means of AP. We consider that better understanding of the aforementioned relationships and confirming the useful parameters will be helpful for the early diagnosis of the severity of sepsis and for the treatment of the septic patients. The investigated patients were nine septic intensive care unit patients with glucose intolerance in whom BG was strictly controlled by means of AP. We selected the patients with strict blood glucose control by AP in order to exclude the direct influence of BG to the parameters related with coagulopathy, including PAI-1-related parameters, as already mentioned. The patients were all in septic condition, which was defined as the condition with systemic inflammatory response syndrome caused by the infection . To analyze the septic patients with sepsis-induced (or related) glucose intolerance, the diabetes patients and those who had liver or pancreatic diseases as primary diseases were excluded. Six patients had acute respiratory distress syndrome (four caused by panperitonitis, two after intracranial hemorrhage), two had gangrene of a lower extremity, and one had a burn (Table 1). One patient with panperitonitis died. ARDS, Acute respiratory distress syndrome; F, female; M, male; NOMI, nonocclusive mesenteric ischemia. Regarding administered drugs that might influence glucose tolerance on the day when the GT measurements were performed (total number of measurements, 18 times (days); 2 times (days) for each patient; see later), dopamine was used for 5 patients (6 days out of 10 measured days), predonisolone for 1 patient (2 days out of 2 measured days), and dobutamine for 1 patient (2 days out of 2 measured days). The amount of dopamine used was less than 5 μg/kg per min (mean, 2.5 ± 1.6 μg/kg per min [n = 6]; all were used for increasing renal blood flow), that of predonisolone was 40 mg/day, and that of dobutamine was 13 and 4 μg/kg per min. Analyzed items were as follows. Regarding MODS, the multiple organ failure (MOF) score was calculated using the MOF criteria of the Japanese Association for Critical Care Medicine  (Table 2). The maximum of the MOF score is 14. The modified MOF score (mMOF score), in which points of disseminated intravascular coagulation (DIC) (coagulopathy) were excluded, was also calculated when the correlation between coagulopathy and MODS was investigated. Judgement of probable disseminated intravascular coagulation (DIC)* and definite DIC* from Criteria of DIC proposed by the Ministry of Health and Welfare of Japan . A-aDO2, alveolar-arterial oxygen difference; AKBR, arterial ketone body ratio; BUN, blood urea nitrogen; CVP, central venous pressure; FDP, fibrin and fibrinogen degradation products; FENa, fractional excretion of sodium; GCS, Glasgow coma scale; JPS, Japan coma scale. 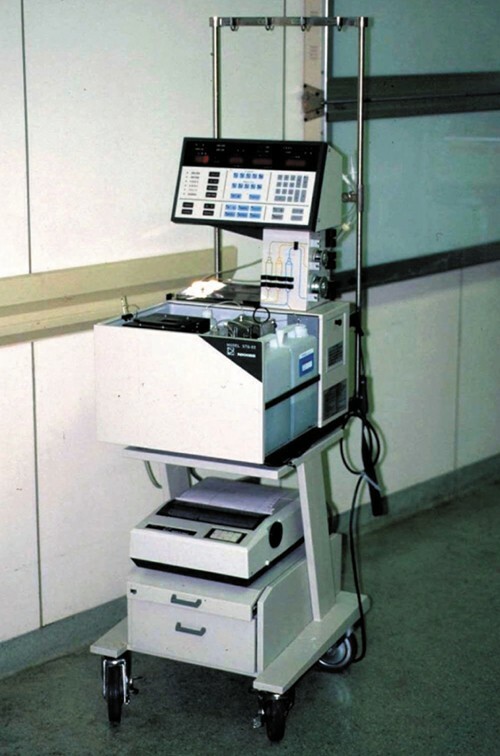 The parameter of glucose metabolism, the M value (the amount of metabolized glucose), was measured by the euglycemic hyperinsulinemic glucose clamp method, in which the BG level was clamped (or maintained) at 80 mg/dl under a continuous insulin infusion rate of 1.12 mU/kg per min (40 mU/m2per min), using AP. The M value is the amount of glucose infusion required to clamp BG, and is the indicator of peripheral glucose tolerance (normal range, 6-8 mg/kg per min) [26,27]. The daily mean blood glucose level was calculated from the BG measured (sampled) every 1 h.
The blood concentration of stress hormones (catecholamines [adrenaline, noradrenaline, dopamine], growth hormone, glucagon, cortisol), adrenocorticotrophic hormone, and thyroid-related hormones (thyroid stimulating hormone, triiodothyronine [T3], free T3, thyroxine [T4], free T4) were measured because they might influence the GT. Dopamine, dobutamine, and predonisolone were administered when the measurements of the M value were performed in some patients as already mentioned. Regarding coagulopathy, the following parameters were used: DIC score, platelet count (PLT), fibrin and fibrinogen degradation products, fibrinogen, prothrombin time (PT) ratio (PT of the patient divided by control PT), D-dimer, α2 plasmin inhibitor-plasmin complex, thrombin-antithrombinIII complex (TAT), protein C antigen and activity, protein S antigen and activity, plasminogen, antithrombin III (AT-III), PAI-1 antigen and activity, and tissue plasminogen activator (tPA)-PAI-1 complex. The DIC score was calculated from the DIC criteria of the Ministry of Health and Welfare of Japan  (Table 3). *Exclusion: this DIC criteria cannot be applied for neonates, pregnant woman, and patients with fulminant hepatitis. FDP, fibrin and fibrinogen degradation products. As the indicator of the endothelial cell injury, the blood concentration of thrombomodulin (TM) was measured. Fibrinogen was measured by the thrombin time method, PT by Quick's method, and fibrin and fibrinogen degradation products by the latex agglutination method. TAT, tPA-PAI-1 complex, protein S antigen, protein S activity and TM were measured by enzyme immunoassay, D-dimer and PAI-1 antigen by enzyme-linked immunosorbent assay, and α2 plasmin inhibitor-plasmin complex and protein C antigen by the Latex photometric immunoassay. AT-III, PAI-1 activity and plasminogen were measured by the synthetic substrate method, and protein C activity by the activated partial thromboplastin time method (SRL Inc Co, Tokyo, Japan). Data sampling/measurement (blood sampling, MOF/DIC scoring, and glucose clamp method) was performed twice for each patient. The first data sampling/measurement was carried out within 3 days after the admission, and the second data sampling/measurement was performed 1 week after the first data sampling/measurement. Blood sampling was carried out at 08:00 h on the day when the glucose clamp method (the measurement of the M value) was performed. We began the glucose clamp method at 09:00 h, when intravenous drip infusion containing glucose for nutritional support was stopped. The daily mean blood glucose level was calculated using the BG during 24 h before the start of the glucose clamp method. The following points were investigated in turn using the aforementioned data. First, confirmation of the capability of the AP for strict blood glucose control (by calculating the daily mean BG) and for the evaluation of the GT (M value). Whether the blood concentration of the stress-related hormones (listed earlier), which are considered to be influenced by sepsis and by the administration of drugs, was related to the GT (M value) was also investigated. Third, whether there were any relationships between the glucose tolerance (M value) and coagulopathy, MODS (MOF score). The relationships among coagulopathy, MODS (MOF/mMOF score), and endothelial cell injury (TM) were then investigated. Finally, confirmation of the parameters related to coagulopathy that were most closely correlated with MODS (MOF/mMOF score) and endothelial cell injury (TM). The AP used was STG-22, manufactured by NIKKISOH Corporation (Tokyo, Japan) (Fig. 1). The AP controls BG by administering insulin or glucose automatically according to the absolute BG and the change of BG, which is measured by continuous blood sampling. The statistical data are shown as mean ± standard deviation. Strengths of the relationships between the data are indicated by correlation coefficient r, and the correlations between the data are shown by a regression line. The unpaired Student t test was used for the comparison of mean values. P < 0.05 was considered significant. The mean of the daily mean blood glucose levels and M values obtained from the first and second measurements were 183 ± 32 mg/dl (n = 8), 4.4 ± 1.4 mg/kg per min (n = 7), and 147 ± 26 mg/dl (n = 9), 4.7 ± 1.6 mg/kg per min (n = 8), respectively (Table 4). The daily mean blood glucose level could not be calculated in one patient at the first measurement because a blood sampling disorder of AP occurred and a sufficient number of BG data could not be obtained. M values could also not be measured in two patients at the first measurement and in one patient at the second measurement because the glucose intolerance was severe and the BG level did not decrease to the clamp level (80 mg/dl). The first measurement was performed within 3 days after admission, and the second measurement was performed 1 week after the first measurement. There were no significant correlations between the M value and blood stress hormone levels (adrenaline, noradrenaline, dopamine, growth hormone, glucagon, cortisol), adrenocorticotrophic hormone, and thyroid-related hormones (thyroid stimulating hormone, T3, free T3, T4, free T4) (Table 5). We also investigated whether drug (catecholamines [dopamine, dobutamine], glucocorticoids [predonisolone]) administration significantly influenced the glucose tolerance. There was, however, no significant difference between the mean of the M values of the patients who were administered those drugs (4.9 ± 1.3 mg/kg per min; n = 10) and that of those who were not administered those drugs (4.0 ± 1.7 mg/kg per min; n = 5). ACTH, Adrenocorticotrophic hormone; TSH, thyroid stimulating hormone; T3, triiodothyronine; T4 = thyroxine. There were no significant correlations between the M value and MODS, and parameters related to coagulation and fibrinolysis (Table 6). AT-III, antithrombin-III; DIC, disseminated intravascular coagulation; FDP, fibrin and fibrinogen degradation products; PAI-1, plasminogen activator inhibitor-1; PIC, α2 plasmin inhibitor-plasmin complex; PLT, platelet count; PT, prothrombin time; TAT, thrombin-antithrombin complex; tPA, tissue plasminogen activator. The MOF score was strongly correlated with the DIC score (r = 0.75, P < 0.002), TAT (r = 0.72, P < 0.002), tPA-PAI-1 complex (r = 0.69, P < 0.002) and PLT (r = -0.68, P < .002) among parameters related with coagulation and fibrinolysis (Table 7). 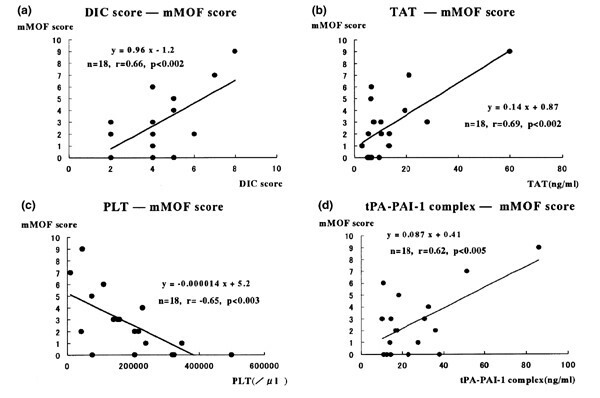 Because three of the aforementioned parameters (not the tPA-PAI-1 complex) are used for calculating the MOF score, however, correlations between the mMOF score, in which the points of coagulopathy of the MOF score are excluded, and parameters related to coagulation and fibrinolysis were also analyzed. The mMOF score was still strongly correlated with TAT (r = 0.69, P < 0.002), DIC score (r = 0.66, P < 0.002), PLT (r = -0.65, P < 0.003) and tPA-PAI-1 complex (r = 0.62, P < 0.005) (Table 8; Fig. 2). Correlations between mMOF score and parameters related to coagulation and fibrinolysis. The mMOF score (mMOF score = MOF score - the points of coagulopathy of MOF score) was positively correlated with (a) the DIC score, (b) TAT and (d) tPA-PAI-1 complex, and (c) negatively correlated with PLT. AT, Antithrombin; DIC, disseminated intravascular coagulation; FDP, fibrin and fibrinogen degradation products; PAI-1, plasminogen activator inhibitor-1; PIC, α2 plasmin inhibitor-plasmin complex; PLT, platelet count; PT, prothrombin time; TAT, thrombin-antithrombin complex; tPA, tissue plasminogen activator. * mMOF score = MOF score - points of coagulopathy of the MOF score. AT, Antithrombin; DIC, disseminated intravascular coagulation; PAI-1, plasminogen activator inhibitor-1; PIC, α2 plasmin inhibitor-plasmin complex; PLT, platelet count; PT, prothrombin time; TAT, thrombin-antithrombin complex; tPA, tissue plasminogen activator. TM was correlated with MOF score (r = 0.92, P <0.002) (Fig. 3), DIC score (r = 0.80, P < 0.002), tPA-PAI-1 complex (r = 0.85, P < 0.002), TAT (r = 0.85, P < 0.002) and PLT (r = -0.58, P < 0.03) (Table 9; Fig. 4). In one patient, the measurement of TM was performed only once. 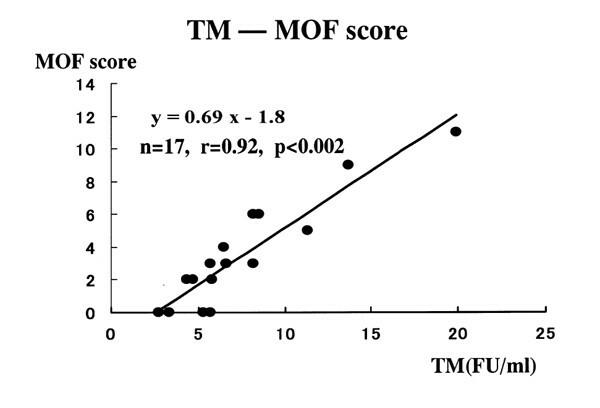 Correlation between TM and MOF score. The MOF score was positively correlated with blood TM level. Correlations between TM and parameters related with coagulation and fibrinolysis. 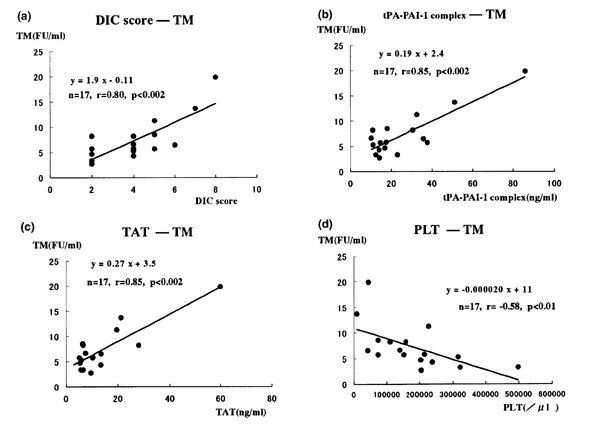 Blood TM levels were positively correlated with (a) the DIC score, (b) tPA-PAI-1 complex and (c) TAT, and (d) negatively correlated with PLT. * Mean of TM, 7.3 ± 4.2 FU/ml (n = 17); normal range, ≤ 4.5. AT-III, antithrombin-III; DIC, disseminated intravascular coagulation; FDP, fibrin and fibrinogen degradation products; PAI-1, plasminogen activator inhibitor-1; PIC, α2 plasmin inhibitor-plasmin complex; PLT, platelet count; PT, prothrombin time; TAT, thrombin-antithrombin complex; tPA, tissue plasminogen activator. The tPA-PAI-1 complex was positively correlated with DIC score (r = 0.74, P < 0.002), TAT (r = 0.85, P < 0.002), and PAI-1 antigen (Table 10). AT-III, antithrombin-III; DIC, disseminated intravascular coagulation; FDP, fibrin and fibrinogen degradation products; PIC, α2 plasmin inhibitor-plasmin complex; PLT, platelet count; PT, prothrombin time; TAT, thrombin-antithrombin complex. Acutely ill patients often have coagulopathy and metabolic disorders, including glucose intolerance and abnormal serum fat levels, as well as organ dysfunctions. Those abnormalities seem to be mutually related, but studies concerning relationships among coagulopathy, metabolic disorders, and organ dysfunctions have rarely been reported. One of the reasons for this lack of literature seems to be that metabolic disorders, especially glucose intolerance, are unstable and could not be easily evaluated in acute phase. In this study, we have investigated those relationships under strict blood glucose control and the strict evaluation of the GT with the glucose clamp method by means of AP in septic patients with glucose intolerance. Although the glucose tolerances of the patients were impaired, blood glucose control by means of AP was good, considering results of the mean of the M values and the daily mean BG (Table 4). We could not measure the M value three times because the GT was so severe that BG did not decrease to the clamp level (80 mg/dl). This problem was considered to indicate the necessity of the improvement for measuring the M value in patients with severe GT (eg increasing the amount of insulin infusion, stopping intravenous drip infusion earlier than 09:00 h, etc). There are many factors that influence BG or the GT. Stress hormones and thyroid-related hormones are well known to be included in those factors, and they are also used as the drugs. In the present study in which the AP strictly controlled BG, however, those hormones did not significantly influence the glucose tolerance. This is determined from the results that there were no significant correlations between the M value and the blood concentration of these hormones (Table 5), and that there were no significant differences in the M values between the patients who were administered these hormones and those who were not. We consider that sepsis induced by some other factors other than these hormones impaired the glucose tolerance. The relationship between GT including fat metabolism and hypercoagulability, indicated by the increased levels of PAI-1 or tPA-PAI-1 complex, has been well investigated in the patients with NIDDM [5,29,30], with hypertension [31,32,33,34], with coronary artery disease , and in the normal human subjects or the general population [36,37]. In these studies, PAI-1 or tPA-PAI complex was closely related with, and thought to be caused by, hyperinsulinemia, hyperglycemia, insulin resistance, hypertriglyceridemia, hypercholesterolemia, and increased level of high density lipoprotein cholesterol. In vitro studies using endothelial cells, hepatoma cells, or vascular smooth muscle cells showed that PAI-1 was produced by glucose, insulin, free fatty acid, cholesterol, very low density lipoprotein, glucocorticoids, and hyperosmolarity [18,19,20,21,22,23]. In our study performed under strict blood glucose control by means of AP, however, the glucose intolerance was not a significant factor influencing MODS and coagulopathy, considering from the results that there were no significant correlations between the M value and the MOF score, parameters related with coagulation and fibrinolysis (Table 6). In addition, under this strict blood glucose control, BG, blood insulin and fat levels did not significantly influence the coagulopathy, because there were no significant correlations between parameters related with coagulation and fibrinolysis and daily mean BG, blood insulin concentration, and serum fat (triglyceride, total cholesterol, free fatty acid) levels (data not shown). These results are considered to indicate that the influence of the GT and the factors related with the glucose tolerance (eg BG, blood insulin and fat levels) to coagulopathy could be excluded by the strict blood glucose control using AP. Relationships between coagulopathy and chronic organ dysfunctions have been well investigated. The hypercoagulable state or decreased fibrinolytic activity in NIDDM patients, shown by increased levels of PAI-1, fibrinogen, factor VII, von Willebrand factor, and tPA, are considered to be risk factors of cardiovascular diseases [1,2,3,4,5,6,29,38,39]. Increased PAI-1 level is especially thought to be a causative factor of atherosclerosis [5,6,38]. In patients other than those with NIDDM, including those with insulin-dependent diabetes mellitus , history of myocardial infarction , and hypertension [31,32,33], hypercoagulable states with increased PAI-1 level are also considered to be one of the risk factors of coronary atherosclerosis or hypertension. Increased PAI-1 level seems to be the cause of, and not only the result of, cardiovascular diseases or atherosclerosis, because it was shown in an animal study that increased expression of PAI-1 in the arterial wall preceded atherosclerosis . Relationships between hypercoagulable state and sepsis or septic MODS have been investigated in recent years [7,8,9,10,11,12,13]. The hypercoagulable state, shown by increased levels of PAI-1 [7,8,10,13], TAT [7,8,9], and prothrombin fragment 1 + 2 , and by decreased levels of AT-III [7,9,11,12], factor VII [7,11], and protein C , were reported in these studies to be closely related to septic MODS. As mentioned in the Introduction, however, metabolic factors including glucose and fat that are considered to influence those parameters related with coagulopathy are not taken into consideration in those investigations. In our study, performed with strict blood glucose control by AP, the MOF score (mMOF score) was positively correlated with the DIC score, TAT, and tPA-PAI-1 complex, and was negatively correlated with PLT (Tables 7 and 8; Fig. 2). The tPA-PAI-1 complex, which is reported to positively correlate with tPA [42,43,44,45], is considered to be a parameter of hypercoagulability and decreased fibrinolysis, and to be closely related with thrombotic diseases [42,43]. The tPA-PAI-1 complex was in fact also positively related with TAT (Table 10) in this study, which is the parameter of hypercoagulability. On the contrary, there were no significant correlations between the MOF score (mMOF score) and parameters related with fibrinolysis (α2 plasmin inhibitor-plasmin complex, fibrin and fibrinogen degradation products, D-dimer). Judging from the aforementioned results in the present study, hypercoagulability and decreased fibrinolysis, indicated by the increase of the tPA-PAI-1 complex and TAT, were considered to be closely related with MODS in acutely ill septic patients. The tPA-PAI-1 complex, which is not used for calculating the MOF score and the DIC score, also seemed to be a useful and sensitive marker of MODS. Moreover, a hypercoagulable state indicated by the elevated tPA-PAI-1 level may be one of the risk factors and predictive markers of MODS. This follows from studies reporting that the hypercoagulable state preceded MODS, in which significant changes of the parameters related with hypercoagulability were found at the onset of sepsis . We also found that changes of the tPA-PAI-1 complex preceded those of organ dysfunctions in some cases (data not shown). These findings suggest that the hypercoagulable state disturbs microcirculation and leads to MODS [8,10]. There were close correlations between MOF score (mMOF score) and TAT and tPA-PAI-1 complex, but no significant correlations between MOF score (mMOF score) and PAI-1, AT-III, and protein C in our study. The reasons for this are not clear, but may be related to the conditions in which our investigation was performed under strict blood glucose control by means of AP, related to the limited number of the patients in our study, or related to the origin of the parameters. PAI-1 is synthesized not only by the endothelium, but also by the liver, vascular smooth muscle cells, and platelets . AT-III is synthesized by the liver and endothelium, and protein C by the liver. On the contrary, the tPA-PAI-1 complex is considered to be synthesized mainly by the activated endothelium, because the tPA-PAI-1 complex is the indicator of tPA, as already mentioned, and tPA is synthesized by the endothelium activated with thrombin, cytokines (eg tumor necrosis factor, interleukin-2), endotoxin, endothelin, catecholamine, histamine, and activated protein C [17,47,48]. A positive correlation between MOF score (mMOF score) and tPA-PAI-1 complex therefore suggests not only a close relationship between organ dysfunction and hyper-coagulability, but also an intimate relationship between organ dysfunction and endothelial cell activation. Endothelial cell injury was closely related with MODS and coagulopathy characterized by hypercoagulability with decreased fibrinolysis, judging from the results that TM was closely correlated with MOF score, DIC score, tPA-PAI-1 complex, TAT, and PLT (Table 9; Figs 3 and 4). These results are consistent with the other reports that endothelial cell activation or injury, which are caused by endotoxin, cytokines, complement, and neutrophils [14,15,16,17], causes a hypercoagulable state or DIC, which leads to MODS [14,15,16]. TM is usually considered to be one of the markers of endothelial cell injury. However, TM also seemed to be a marker of endothelial cell activation in septic patients, because there was positive correlation between TM and tPA-PAI-1 complex (Table 9), which was considered to be one of the parameters of endothelial cell activation as mentioned earlier. We investigated acutely ill septic patients with glucose intolerance in which BG was strictly controlled and the glucose tolerance was measured by the glucose clamp method by means of AP, and obtained the following conclusions. The GT did not significantly relate with blood stress related hormone levels, coagulopathy and MODS under strict blood glucose control. Coagulopathy characterized by hypercoagulability with decreased fibrinolysis was closely related with MODS and endothelial cell injury. Among the parameters related with coagulation and fibrinolysis, the tPA-PAI-1 complex, considered to originate from activated endothelium, seemed to be a sensitive parameter of MODS and endothelial cell injury, and might be one of the predictive and risk factors of MODS. Finally, the treatment for reducing hypercoagulability and endothelial cell activation/endothelial cell injury was thought to be justified as one of the therapies for acutely ill septic patients. Further investigation will, however, be necessary for clarifying these conclusions because the number of the patients we investigated was limited. Most of this study was presented at the 18th and 19th International Symposia on Intensive Care and Emergency Medicine, Belgium, March 1998 and March 1999, respectively.